Is the Hanalei Bridge Closing? Aloha school is located on the North End of the Hanalei Bridge. overflow of the Hanalei river floods the main road which prevents vehicles to drive through. When this happens, authorities will close the entrance and exit into Hanalei. to immediately be picked up. ALL parents must have at least 1 emergency contact on the north end of the bridge. *Please note that Aloha School does not have school buses to evacuate the children like Hanalei Elementary school, so we need to close our school at a lower river height to ensure the safe evacuation of our students. *If the Hanalei river height is at 6ft or higher (or is projected to be) before school starts at 7:30am, school will remain closed for the day. *If Hanalei Elementary School is closed for the day due to the river height, then Aloha School will also remain closed. 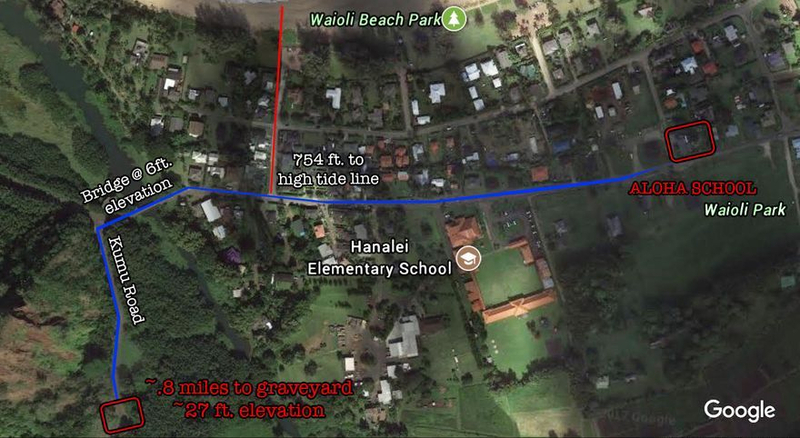 If First Civil Defense advises a tsunami threat within a 10 minute - 1 hour estimated time of wave arrival Aloha Keiki will be evacuated to the Kumu road graveyard past the first bridge after Hanalei Elementary School. We will quickly contact parents once all Keiki are at the evacuation site. *We do an evacuation drill each year.